Browse: Home / 2019 / January / 14 / Regional Models: 3-10°C Warming In The Next 80 Years. 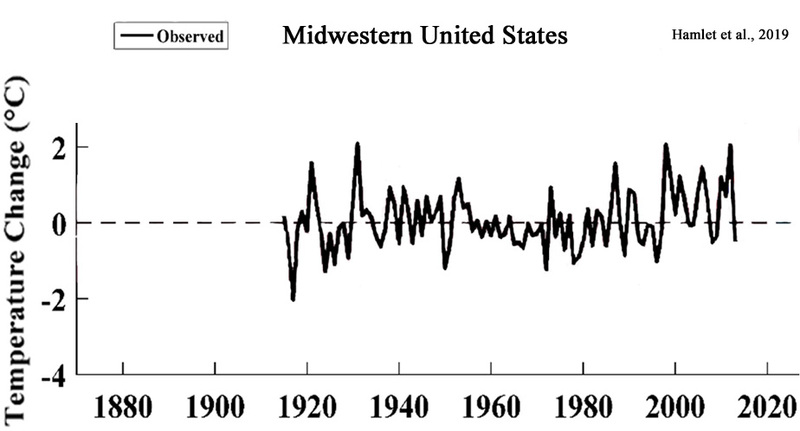 Observations: No Warming In The Last 40-100 Years. 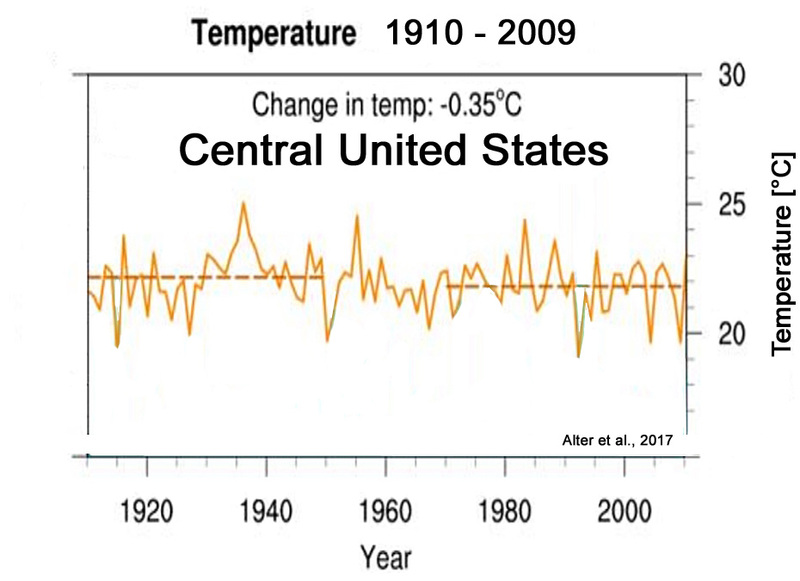 There are large regions of the globe where observations indicate there has been no warming (even cooling) during the last decades to century. Climate models rooted in the assumption that fossil fuel emissions drive dangerous warming dismiss these modeling failures and project temperature increases of 3° – 10°C by 2100 for these same regions anyway. 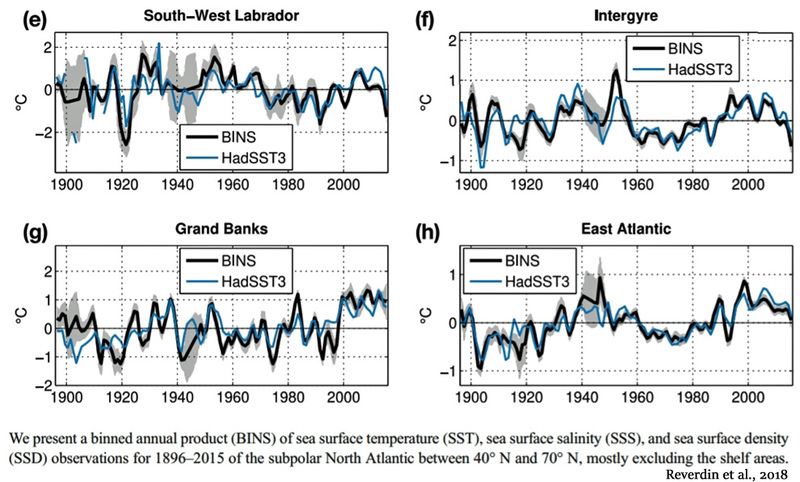 After warming from the 1940s to the mid-1970s, the Southern Ocean has been cooling since the late-1970s, which has consequently resulted in an increase in sea ice extent (Fan et al., 2014; Purich et al., 2018; Latif et al., 2017; Turney et al., 2017 ). 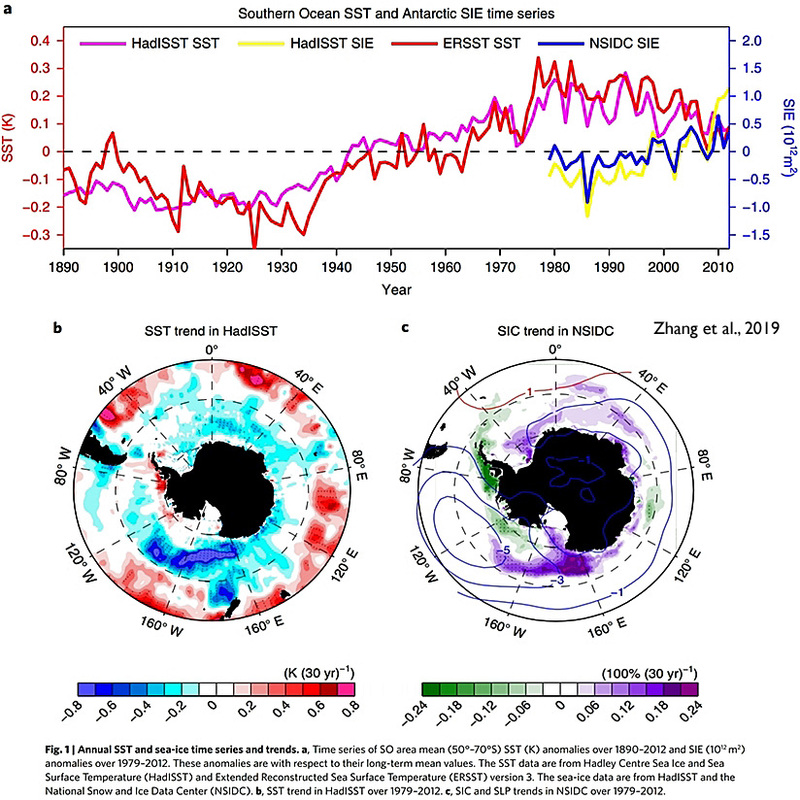 In their paper entitled “Natural variability of Southern Ocean convection as a driver of observed climate trends”, Zhang et al. 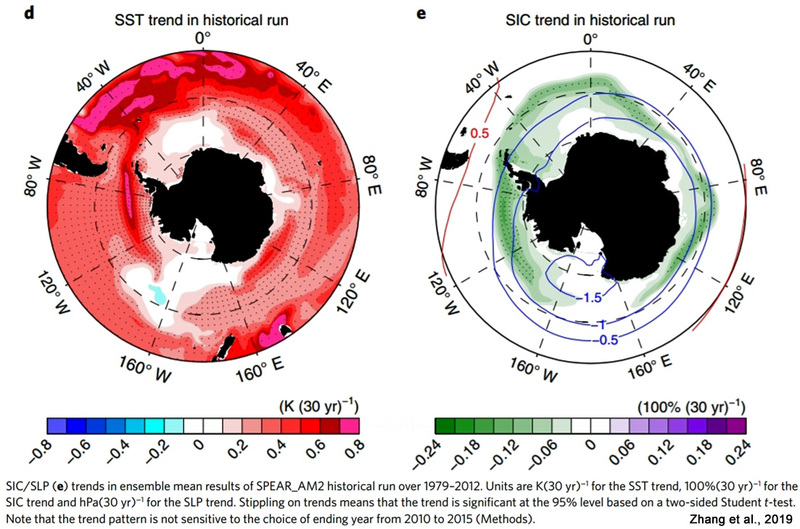 (2019) suggest that the Southern Ocean cooling was driven by natural processes. 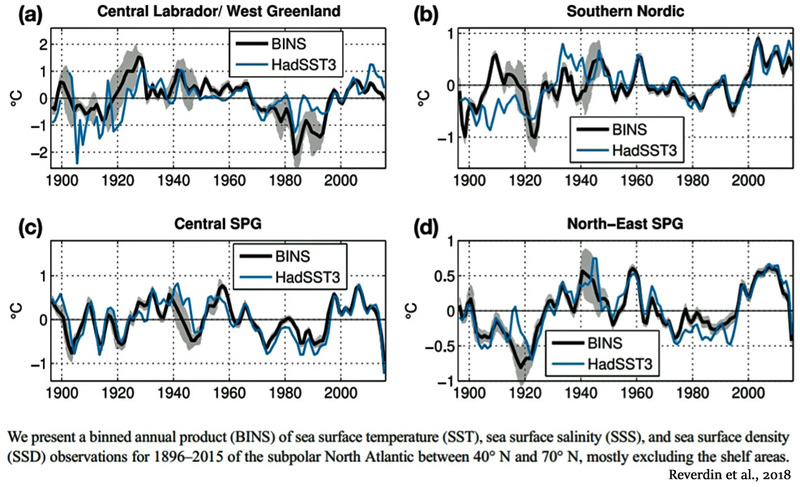 Climate models, in contrast, had projected a rapid warming and significant decreases in sea ice extent during the last few decades. Even though climate models failed to simulate the last 50 to 100 years of temperatures for this region, hindcasting a dramatic warming instead of the observed cooling, the projections for 2100 are still predicated on CO2 emission scenarios (RCP4.5, RCP8.5) as the determinant of regional surface temperatures. 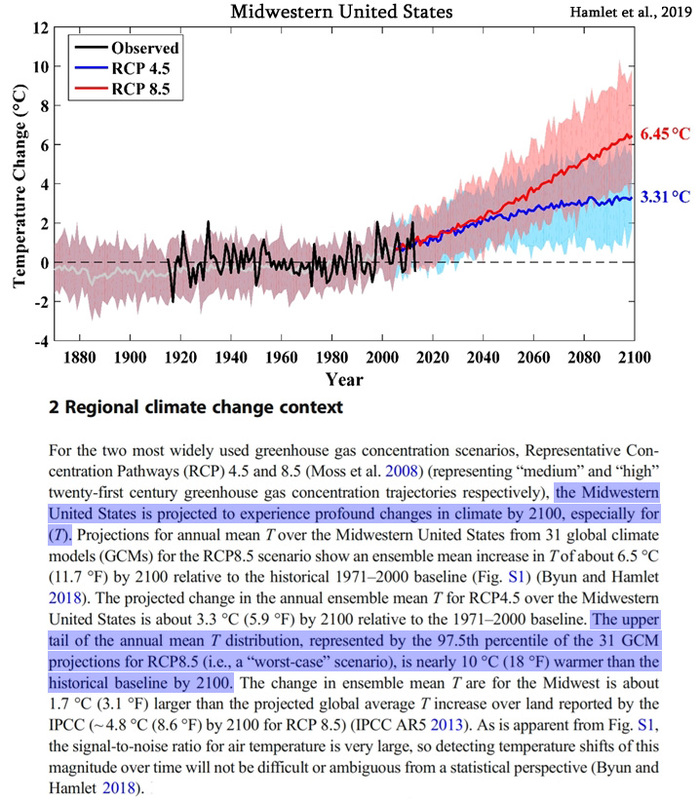 Consequently, the regional models project a warming of 3°C – 10°C over the next 80 years. Back in 1989, Dr. James Hansen, the former head of NASA, predicted that New York City’s West Side Highway would be underwater within 20 years due to rapid global warming and the consequent rising sea levels. A glance at a 2018 image of the West Side Highway indicates that it is still very much above water, no lower than its position in 1936. 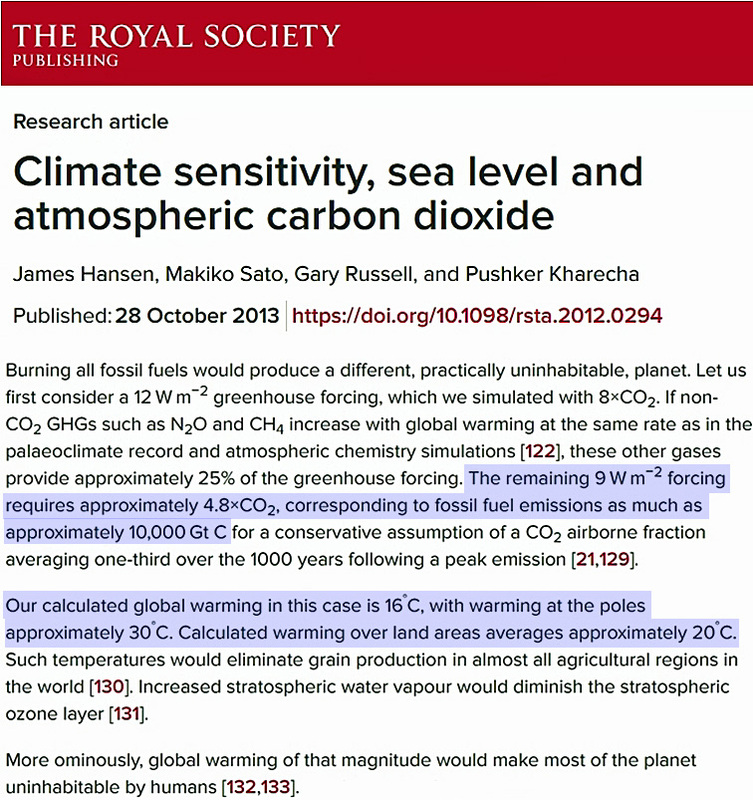 A few decades later (2012), Hansen was the lead author of a paper published by The Royal Society (2013) that indicated ever-growing fossil fuel emissions would lead to a nearly five-fold rise in atmospheric CO2 concentrations (to 1,400 ppm) within 118 years. He then projected this CO2 increase and presumed 9 W m-2 forcing would cause a global surface temperature warming of 20°C by about 2130, with 30°C warming at the poles. Given the documented modeled forecast failures and lack of extreme or dangerous warming in recent decades, is there good reason to assume that Hansen’s prediction of a 20°C warming over the next 110 years will be realized? At what point do modeling failures lead to a reconsideration of the forcing mechanisms? When the flow of money stops. is there good reason to assume that Hansen’s prediction of a 20°C warming over the next 110 years will be realized? When the conditions for this predictions are met, why not? It’s physics. Which one of the laws of physics do you think is applied wrong here? How else would you explain the very first graph in this post? P.S. : The headline isn’t correct. 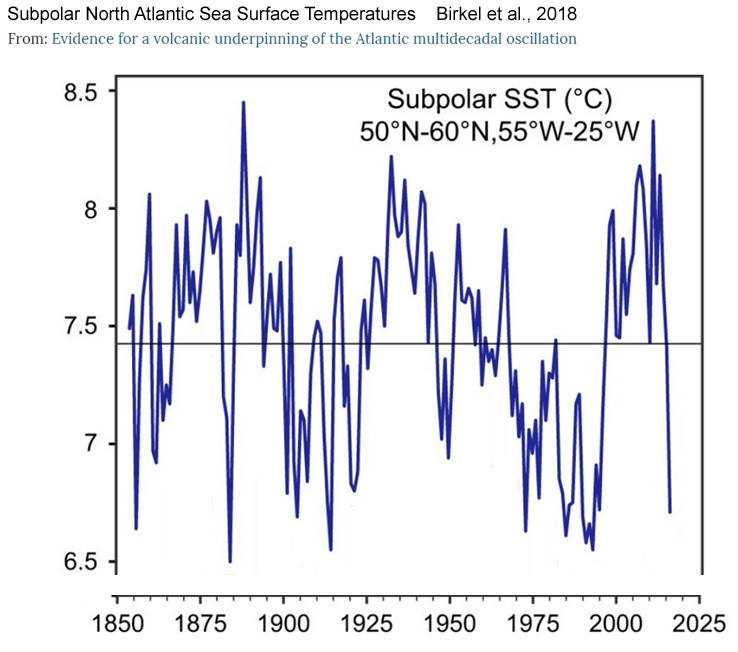 At best it could read “Observations: No Warming in some regions In The Last 40-100 Years.” This reminds of the times you wrote about the Arctic by referring to just one measured location near the Arctic circle. For someone who is usually very pedentatic with words this seems to be a big oversight. The entire headline is correct. Your truncation distorts. For someone who is usually very pedentatic with words this seems to be a big oversight. The title length is limited to a finite number of characters. Repeating the word “Regional” before “Observations” makes the title both too long and redundant, and the introductory paragraph (as well as the body of the article) further clarifies that regions are being referred to, not the whole globe. I see. I wonder why you leave out surrounding sentences when you cherry pick quotes from papers/websites then that remove the context? Unbelievable. So you deny calling skeptics “climate deniers”, then you admit that you thought it better to refer to skeptics as “inexperienced” than “climate deniers”. Then you continue to whine that this sentence was deleted even though we have told you that any time you refer to skeptics this way it will be deleted. I’ll put this one on you automatically reading my replies with an angry internal voice that blocks out all context and makes you just respond to certain trigger phrases. Instead of pondering ways in which you can aptly refer to us and insult us at the same time (i.e., Hmmm, should I call them climate deniers, pseudoskeptics, uneducated, or inexperienced? ), perhaps you should focus more on offering a substantive counter argument to the scientific papers that are reviewed here. This is a blog for those skeptical of the position that humans control the weather and temperature of the Earth/oceans with our CO2 emissions. We prefer to be called skeptics. Please refrain from referring to us with another moniker of your choosing. Refusing to honor this request will result in comment deletion, which is what you have already been told would occur (but nonetheless you whine about it when it happens). There’s no anger whatsoever, with the only exception when you purposely twist my words or make up stuff and claim I wrote it. It’s mostly with an intrigued bemusement (Wow, he actually believes that?) that I read your comments. Sometimes when I’m looking for one thing, another pops up unexpectedly. Here’s a blast from the past I stumbled on yesterday. It would be a shame not to share it. 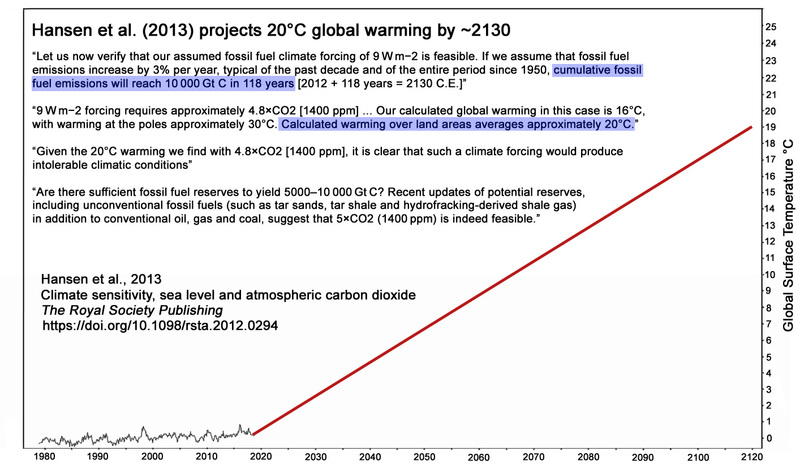 Very information dense, all totally contradictory to the IPCC fantasy. 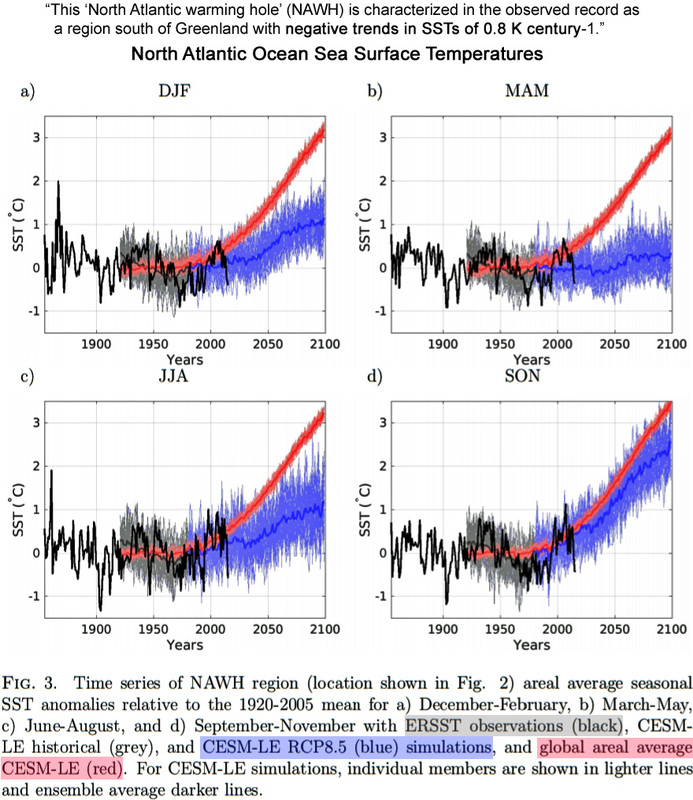 Interesting article on purported ocean heat gains by J. Curry, here. What? I thought the deep oceans are still cooling! 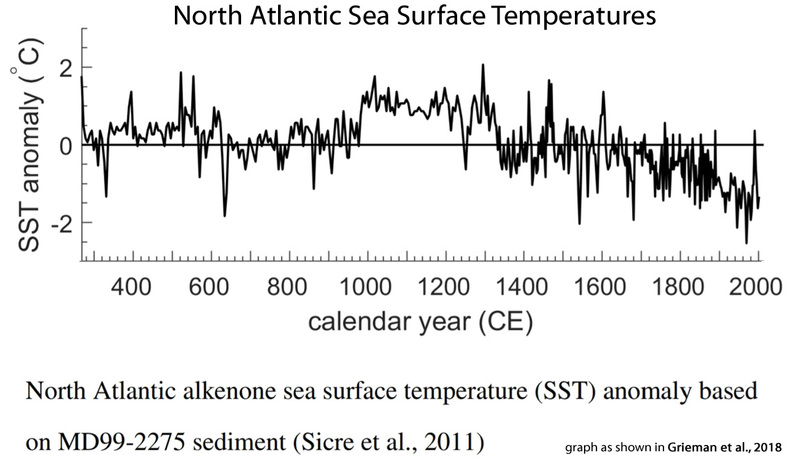 The deep oceans haven’t been said to have “caused” warming (or cooling). There is evidence that the deep oceans began warming 1,000 to 2,000 years before the upper oceans did at the end of the LGM according to Stott et al., 2007. Do you get that from the graph I linked to, Kenneth? I hope not. 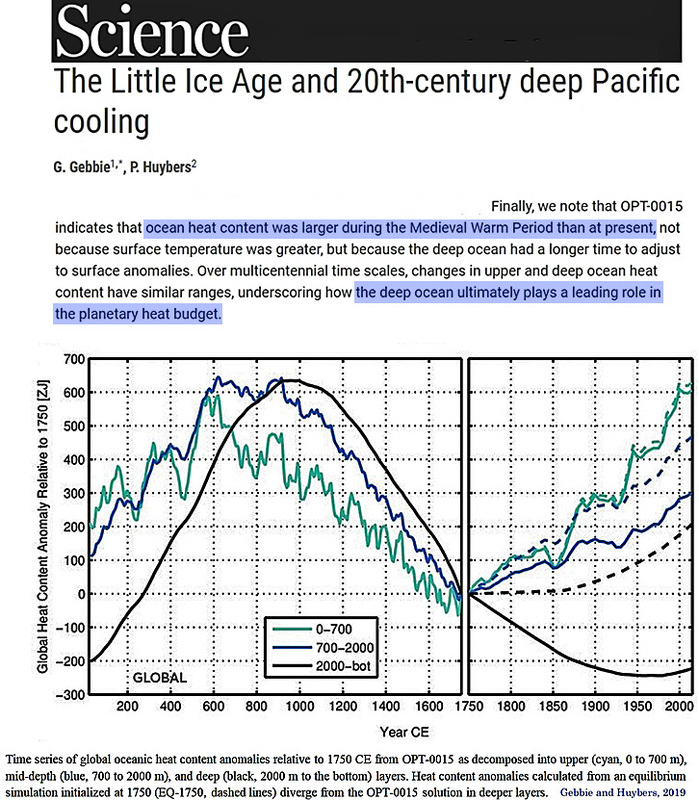 Also this was a reply to Yonason’s quote which states that the deep ocean circulation causes the warming … so how does it do that in accordance with the graph? I read (? where) that if one of our senses is degraded or destroyed, then other of the senses will become better to compensate. I believe the opposite is true also. Thus, when an activist’s brain becomes overheated, the sense of humor is destroyed. Yes, I do believe you have something there. I once heard Penn, of Penn and Teller, say that magic is a lie, and humor is the truth. With regard to the latter, activists for whom winning is everything will tell any lie to accomplish it, and the more they lie the less funny they become. The other side of that coin is that what they are trying to sell us is just a very bad and way over priced magic act. I find it hard to believe an educated researcher would assume this will happen. The entire exercise is silly. SebastianH believes. He calls it “the laws of physics”. Also, his concept of “the science” is to lecture us about how we should be able to find papers that prove he’s right, but almost never provides anything. When he does it’s usually just activist propaganda. But, you know, …like “science,” and stuff. That sounds all too familiar, MGJ. There replies become more ridiculous by the day … those 3% clearly refer to the average increase of CO2 emissions. How is that connected to the laws of physics? It’s just an extrapolation of past emission increases towards the future. And yes, it is hard to believe that this would happen, since we are already making efforts to limit emissions. But Kenneth treats this as a prediction of the future and actually tries to argue against a 20°C warming here. That exercise is indeed silly. Kenneth treats this as a prediction of the future and actually tries to argue against a 20°C warming here. So, to be clear, you also believe that we shall get 20°C of warming if CO2 concentrations are increased by a factor of 4.8 (1950 values, 315 ppm) to a value of 1400 ppm (which is Hansen’s extrapolation)? Regardless of when you believe that happens, is it not your belief that the “laws of physics” indicate 1400 ppm will yield 9 W m-2 of radiative forcing and 20°C global surface warming, with 30°C at the poles? To be extra clear: the resulting warming from a CO2 concentration of value X and the radiative forcing, is based on the laws of physics. The extrapolation of a 3% increase of human emissions is not based on the laws of physics and is merely one scenario of future events playing out. Humanity could as well rise up to the challenge and reach peak CO2 emissions in the next decades. Then the 1400 ppm scenario would obviously never happen. Clear enough for you? You seem to treat this as an actual prediction that it will be 20°C warmer in 118 years. To be extra clear: the resulting warming from a CO2 concentration of value X and the radiative forcing, is based on the laws of physics. The laws of physics require real-world quantified measurements, not modeled assumptions and speculations. The laws of physics do not address how much warming CO2 will cause when the concentration increases, and how much cooling will be caused by lowering the CO2 concentration. All we have is speculation that we think it’s likely that water will warm when the CO2 concentration is increased. But we don’t know how much because it’s not been observed. Therefore, the assumption (and that’s all it is) that we can determine how much warmer the oceans will get when CO2 increases to 1400 ppm is not “the laws of physics”. It’s speculation and assumption. You seem to treat this as an actual prediction that it will be 20°C warmer in 118 years. Again, regardless of when, I assume you believe that Hansen is right, and that we’ll get a 20°C surface warming, and 30°C polar warming, when CO2 concentrations reach 1400 ppm. This is what I have suggested you believe is “the laws of physics” based on what you have written here. …is there good reason to assume that Hansen’s prediction of a 20°C warming over the next 110 years will be realized? My comment was in response to John F. Hultquist’s “The entire exercise is silly.” The “entire exercise” meaning the assumption that humans will cause 20°C warming with their emissions. I see, I wonder how we can use the laws of physics to determine the flight path of a space probe then. We have those laws so we don’t need to measure everything after the fact and slowly approach our desired goals, e.g. send multiple probes on different paths until we get the flight path to the desired destination right. The laws of physics do not address how much warming CO2 will cause when the concentration increases, and how much cooling will be caused by lowering the CO2 concentration. Sure they do. That is very basic physics. With everything else not changing reality would behave like what you can easily calculate. In the real world everything changes all the time, making it difficult to predict the weather at your location into the far future. All we have is speculation that we think it’s likely that water will warm when the CO2 concentration is increased. But we don’t know how much because it’s not been observed. Oh, you think that the energy is going somewhere else then? Somehow the water can make a difference and sends the additional energy from an increased GHE away? So where does it go to? Any theory? Evaporation like old spike55 believed? Therefore, the assumption (and that’s all it is) that we can determine how much warmer the oceans will get when CO2 increases to 1400 ppm is not “the laws of physics”. It’s speculation and assumption. By that logic we can not really determine anything. How much current will I need to drive the motor to move my vehicle. Can’t say, because I haven’t actually measured it, right? How do we send a satellite to geostationary orbit with that logic? Just eyeball it and then correct the flight path on the go until we reach the orbit eventually? Question: do you think it is possible to predict how much warmer a body of water (say on your stove) gets when you turn on a heating element that draws X W of energy from the electrical grid? Or do we need to measure this for every possible combination so you can look it up from a table next time you want to know the outcome? This is what I have suggested you believe is “the laws of physics” based on what you have written here. One that refers to the continued increase of human emissions for 118 years. And you reply to this with this would be “the laws of physics” I believe in. I see, I wonder how we can use the laws of physics to determine the flight path of a space probe then. We use observational evidence – physical measurements – to determine the flight path of a space probe. The laws of physics do not address how much water heating CO2 will cause when the concentration increases, and how much the water will cool by lowering the CO2 concentration. Sure they do. That is very basic physics. Great. So tell me how much does a water body cool down when the CO2 concentration in the air above it decreases by -10 ppm. What’s the real-world measured value derived from “the laws of physics”? So do you believe that “the laws of physics” have determined surface temperatures will warm up by 20°C – with 30°C warming in the Arctic and Antarctica, causing the ice caps to melt completely – if CO2 reaches 1400 ppm and thus +9 W m-2? You believe that’s the warming amount that 1400 ppm CO2 will yield, right? When the conditions for this predictions are met [1400 ppm], why not? It’s physics. Which one of the laws of physics do you think is applied wrong here? We don’t. We simulate the flight path and than execute certain maneuver to send a probe on the desired flight path. Since the laws of physics apply everywhere, this works to get probes to Pluto and beyond. Please tell me a way to actually measure this? How do you keep all other variables constant for the time it takes you to adjust the CO2 concentration by 10 ppm? You can calculate it easily with the laws of physics however and I have shown you how many times already. When you claim that those calculated results aren’t happening in reality you must have some knowledge of some physical mechanisms that we haven’t seen so far, is not covered yet and capable of completely compensating for the increase in forcing. Any idea what that could be? I feel like this is a trap, but let’s see what you’ve got. Yes, I “believe” that the laws of physics allow for a modeled prediction like that. Please state where you think their calculation is wrong? You must have some idea other than the “it’s a model” accusation, don’t you? If not it seems to be just a feeling and as you wrote in the other post/thread: that’s not very substantial. Speaking of “overheated” activist brains. And, no, we’re not the ones to worry about. They are trying to change us, not the other way round. IMO, as long as they keep their paws off of my power supply, transportation and meal plan, they can live in a cave, ride in wind powered nogo-carts and eat grass and bugs by firefly light, for all I care. So seem to care an aweful lot about what others are doing to need to complain as childish as this about the lifestyle of others. “Paranoid feer of the imaginary” is a good term to describe your situation. Please feel free to live out the rest of your life however you like, Florida man. Nobody is forcing you to do anything really, but nevertheless you are in this constant state of irrational fear of being oppressed by “the greens” or something like that. Let go! Enjoy life! Travel! Visit your kids/grand-kids! TELL IT TO THE FRENCH! Translation – It’s most likely NOT anthropogenic emissions that is causing CO2 to rise. It can be noted that that is in complete agreement with Murry Salby’s analysis. And that means that trillions of $$$$ spent to mitigate the effects of CO2 will have no impact whatever. What an horrific waste of resources and source of suffering for so many! I am glad these examples of trying to sound sciency while making a point exist. That post you linked to is a bunch of nonsense. But you are a believer for the cause, so feel free to fall for stuff like that. In your world the CO2 concentration is not caused by human emissions … fine! That’s probably why your world is so different from reality and you come up with these hilarious theories all the time. 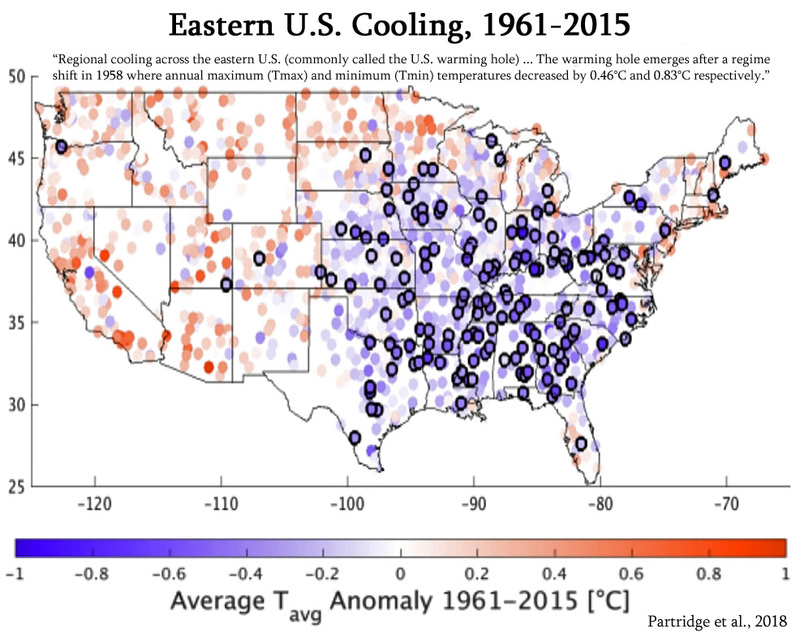 Dr. Ed Berry presented his paper preprint at the American Meteorological Society conference last week. It goes to a journal next. The United Nations Intergovernmental Panel on Climate Change (IPCC) claims human CO2 is responsible for all the increase in atmospheric CO2 since 1750, or above 280 ppm. The IPCC model cannot reproduce how 14CO2 decayed from 1970 to 2014. The IPCC model cannot even predict itself if it is restarted at any future time. The IPCC model assumes human CO2 reduced the buffer capacity of the carbonate system. But the 14C data show the buffer capacity has not changed. The IPCC model treats human and natural CO2 differently, so IPCC model is fundamentally wrong. By contrast, a simple physics model makes only one assumption: outflow is proportional to level. It accurately predicts the decay of 14CO2 from 1970 to 2014 and shows its e-time is 16.5 years. This is the upper bound e-time for 12CO2. The physics model shows human and natural CO2 behave the same. Neither accumulate in the atmosphere. Human and natural CO2 inflows set independent and additive balance levels for CO2 in proportion to their inflows. The level moves to its balance level until outflow equals inflow. Then the level remains at its balance level so long as inflow remains constant. Continued, constant human emissions do not add more CO2 to the atmosphere. The simple physics model concludes human CO2 adds only 18 ppm to the atmosphere while natural CO2 adds 392 ppm. Human CO2 does not cause climate change and all efforts to reduce human CO2 emissions will not stop climate change. The timer is started. I’m sure I’m not the only one here who is eagerly awaiting the troll’s best shot, ….any millennium now. mentioning Dr. Ed Berry and his “simple physics model” which is so obviously wrong, automatically disqualifies you from any discussion on this topic. So you’ve decided I cannot even participate in a discussion about CO2 concentration change sources because I had the temerity to provide a link to Dr. Berry’s preprint paper? Why do you get to decide what discussions I’m allowed to participate in? He is wrong, there is a reason he never could published this anywhere for years. He’s not tried to publish his paper in a journal before. Presenting at the AMS conference occurred just last week and was very well received. You are welcome to go present your case as to why you believe he is wrong on his blog’s comment section. He will reply directly to you, so you can show him up once and for all. If you want to unskeptically believe what he writes, fine. Do that! I won’t stop you, but you know what that makes you, right? I don’t “unskeptically believe what he writes”. I am not convinced that his conclusions are valid. I do think they’re worth considering, though. That’s why I refer to his working paper. Why do you get to decide what discussions I’m allowed to participate in? Because you fall for stuff like this? How could anyone discuss something with a person like that? You can take part, but why should I take you seriously when you support the great Ed Berry CO2 story with his examples about milk in coffee and such? You are welcome to go present your case as to why you believe he is wrong on his blog’s comment section. He will reply directly to you, so you can show him up once and for all. I do think they’re worth considering, though. That’s why I refer to his working paper. They are not. He is right with one thing, at equilibrium constant human emissions won’t influence the CO2 concentration anymore. Inflow would match the outflow. But we are not at equilibrium and human emissions have been anything but constant. It was worth considering for you as well, when some scientist wrote about sea level rise not affecting the coasts because the water is shallow there and thermal expansion would not have as much to work with 😉 I can list more examples of what you rather believe in than what is actually happening. So you think I cite preprint scientific papers presented at the latest AMS conference and authored by a Ph.D physicist so that someone like you (who believes high CO2 causes mass extinctions and therefore 30,000 species are going extinct every year) for the purpose of hoping that you’ll take me seriously? Do you really think I am concerned about how someone who believes humans control the weather and cause the Earth to spin faster/slower on its axis views me? You can easily find rebuttals online, why should I repeat those in his comment section? Are you concerned that it wouldn’t turn out well for you if you tried to go head-to-head with him? Why are you wasting your time over here when you could go over there and set him straight about how wrong he is…so that he doesn’t mislead people by publishing his paper and speaking at more conferences? It shouldn’t take too long. Go take him on. I’d love to see how well you’d do. Just create a log-in name, provide an e-mail, and your “rebuttal” will appear. Personally, I find the whole question about the extent to which we influence atmospheric CO2 rather fascinating. But we are not at equilibrium and human emissions have been anything but constant. Should I have any confidence at all that you have accurately represented what Dr. Berry has actually written? Answer: no. You purposely misrepresent what he’s written. I have no idea about what argument this is. But I would likely be right if I would guess that you have purposely misrepresented what this scientist (whoever he is) wrote. what you rather believe in than what is actually happening. You believe 30,000 species a year are going extinct because high CO2 causes mass extinctions. What’s actually happening: 1 species has gone extinct since 2000. A mollusc. Why should I assume that what you believe is happening is actually happening? SebH please don’t read as it goes against your religion belief. If you do you’ll probably comment about it, and that would be very foolish of you. No, I think that is exactly what they are hoping to accomplish, planetary devastation on an apocalyptic scale. If you want to be able to recognize the most dangerous “environmental hazard,” look no further than faux-greenies, and their brainwashed minions. Do you really think I am concerned about how someone who believes humans control the weather and cause the Earth to spin faster/slower on its axis views me? Yes, otherwise why reply with a Ed Berry link? You seem to think that shows others readers just how wrong I would be. Is that correct? Why do yourself what others have done already? Why are you not debating climate scientists directly and show them your lists of papers and tell them how wrong they are about lots of topics? You should easily win, don’t you think? Or are you afraid that nothing your bring up as a skeptic talking point holds in a discussion with someone who actually works in that field? Have you ever presented your theories to a physicist at your local university/college? Or even a highschool teacher? Anyway, if i find the time, I might comment over there. But the error in his thinking of what caused the CO2 concentration increase is pretty obvious to anyone who discovered that he exists. Yes, otherwise why reply with a Ed Berry link? I replied with Dr. Berry’s pre-print paper because it’s evidence that there are still reasonable and unresolved issues with the belief that 100% of the changes in CO2 concentration are human-caused. Why do yourself what others have done already? What have others done already? I doubt you’ve even looked into more than cursorily. Since you’ve misrepresented his position, I’m assuming you haven’t really looked into it much. I’ve tried many times to engage with climate scientists on RealClimate.org. My comments never get published. They are not interested in debate over there. They shut it down. Have you ever presented your theories to a physicist at your local university/college? Or even a highschool teacher? Actually, yes. Although I have no “theories” of my own, the original skepticism for the CO2 greenhouse effect was inspired by a high school physics teacher, who pointed out that there is no real-world evidence that CO2 concentration increases cause water to warm. He’s a skeptic, but he has to keep it secret. Can’t cross the orthodoxy. Anyway, if i find the time, I might comment over there. Please do. He welcomes debate and those who might offer “correction”. That’s what real scientists do. Oh please, I am very curious of what you think his keypoints are. Can you explain it to me (in your own words) since apparently I don’t “know”. Well and do you think they “shut it down” because they don’t like to repetitively reply to the same skeptic talking points over and over or because you might be on to something and they don’t want the public to know “the truth”? He’s a skeptic, but he has to keep it secret. Can’t cross the orthodoxy. Oh the mythical secret skeptics hiding everywhere and not being able to speak out because of the big conspiracy that suppresses such views. I get it. Ed Berry is a scientist. You are an anonymous internet troll. OK, Russell, let me know what it is I need to talk to this cartoonist about. I watched 10 minutes of the video. What do you think is to be learned/gained from it that applies here? Be specific. I fast forwarded to after 10 minutes, and he doesn’t get any better. He gets some stuff right, and other stuff wrong. Seems to be unable to think outside of his cartoon box at times. Good cartoonist, not so good stand-up. You don’t need comedic timing for a comic strip, but for live performance it’s essential. Adams doesn’t have it. Oh, and yeah, I don’t see any connection with this article, unless maybe at the end I couldn’t endure getting to.